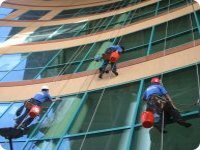 Services | Shadbolt Rope Access Ltd.
Shadbolt Rope Access have a proven record in contract window cleaning in both commercial and residential developments. The use of rope access is becoming ever more necessary owing to the large increase in glazing and cladding used in today’s dynamic and intricately designed modern commercial and residential high-rises. For more infortmation about this service, please contact Shadbolt Rope Access Ltd. for more details. Please click here to contact us today. 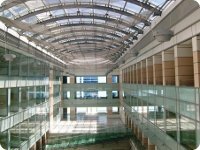 Atriums are usually beyond the reach of normal cleaning routines. This can lead to dust accumulation. Shadbolt Rope Access are often able to gain access using rope techniques rather than expensive hydraulic platforms or scaffolding towers. For the past 6 years Shadbolt Rope Access have worked closely with some of the largest duct-work cleaning and ventilation companies in the country. Developing safe systems and procedures for cleaning difficult to access duct-work risers. We have cleaned hundreds of risers many of which have never been accessed before. Our “Rig For Rescue” procedure ensures that all work is carried out in the safest possible manner. With new fire safety law taking the responsibility of fire safety away from the fire authorities responsible person within a company, many people are finding peace of mind in knowing that previously unclear areas within their jurisdiction are now able to be reached and made safer. Duct-work cleaning is a “confined space” procedure and as such treated with the all the due confined space considerations. All out operatives are trained and certified in this area and any work carried out is fully risk assessed in accordance with the HSE Management of Health at Work Regulations 1999. Water fed pole systems provide a safe means to reach and wash high areas. 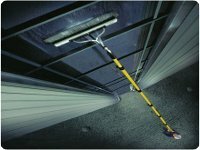 They eliminate the use of ladders and the need for expensive and hazardous equipment. 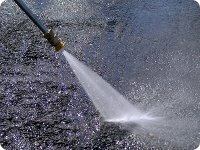 Pressures in excess of 100psi ensure powerful water jets can clean windows, glass roofs, skylights, signs, atria, and canopies with ease. 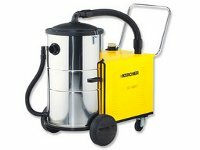 Industrial pressure washers use high-pressure water to remove mould, grime, dust, mud and dirt from surfaces and objects such as buildings, vehicles and concrete road surfaces. All Shadbolt Rope Access technicians are trained to use high pressure systems. Blocked rain gutters prevent water drainage and can cause your guttering to pull away from your fascias. This can then lead to water overflowing from blocked gutters which can run down walls causing them to become damp. 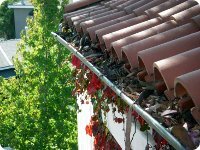 We provide a premier gutter, gulley and downpipe cleaning service. We use modern pneumatic vacuum systems to efficiently process most types recoverable materials including dusts, sludges, solids and powders. Additionally our technicians are trained in the use of backpack and shoulder carried vacuum cleaners. 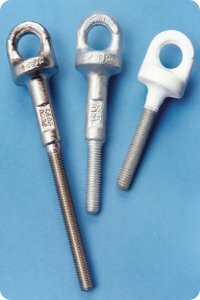 A safety anchor eyebolt is an attachment point used to protect against the potential risk of a fall. Eyebolts installation is carried out by our highly qualified personnel who install and test to BS 7883. All Safety Anchors Eyebolts have been manufactured in accordance to BS EN795. Once installed the eyebolts are tested to a 5kn force and an identity disc is positioned behind all eyebolts stating that the eyebolt is for attachment of Rope Access/PPE only. We provide targeted treatments to deal with any rodent problems. We can use chemicals, traps, electronic measures or humane cages to remove pests from your premises. We can block the openings in your premises where pests tend to gain entrance and we will also offer advice on how to keep your home free of rodents in the future. 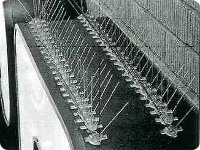 Bird control spikes and netting prevent birds from perching on your property. Birds can produce large quantities of unsightly and unhygienic feaces. Shadbolt Rope Access are able to install netting or spiking to most window, pipe or ledge where birds may roost. 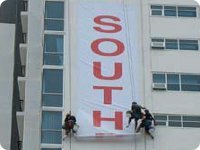 Shadbolt Rope Access has broad experience in the field of outdoor banner installation and removal. We are able to install banners and signage on most structures and buildings. The advantage of our rope access approach to installation is cost, safety and flexibility.